"Now You Can Understand How to Read Architectural Symbols on Blueprints Easier." Architectural symbols are graphical representations of different features (such as doors, windows, stairs and appliances) that appear on blueprint plans or elevation drawings. These are usually found on blueprints, or engineering CAD drawings, of homes and other buildings. The architectural drafting symbols can vary in appearance from one plan to another, but can usually be distinguished fairly easily once you have a basic understanding of their meanings. Below are some sample symbols for you to review. They include symbols used on architectural drawings that denote what a concrete wall looks like. 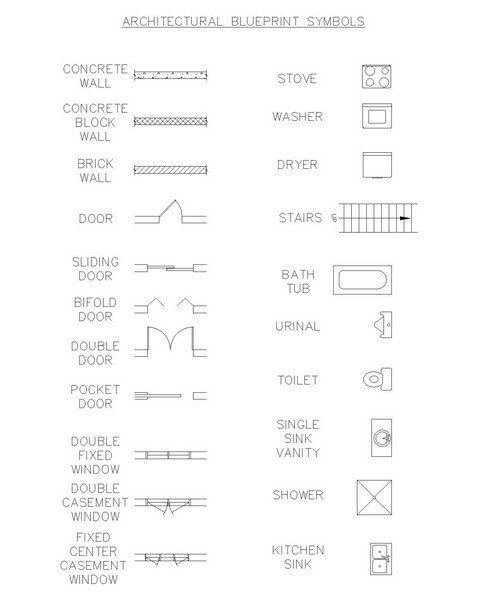 Also included are symbols for: concrete block wall, brick wall, door, sliding door, bi-fold door, double door, pocket door, double fixed casement window, fixed center window, stove, washer, dryer, stairs, bath tub, urinal, toilet, single sink vanity, shower and a kitchen sink. These pictures below should give you a rough idea of what the basic blue print symbols mean and should also help you in your dealings with architects, designers, contractors and suppliers. Remember to ask any questions you may have regarding any architectural drafting symbols that may not be clear to you. There is a link at the bottom of this page to open a .pdf file that you can download and print a copy. Click here to get a free copy of the above architectural blueprint symbols for printing. It is important that have a full understanding of what you are looking at, with respect to your plans.